More details, including how the information will be used, and how to access the survey, can be found here. The meeting was well attended – people were standing in the aisles – demonstrating a real desire to help. Mr Hassan, the secretary of the Bosra Museum of Folk Traditions, was killed by a sniper on the morning of the 26 May 2014 as he was leaving for work. Our thoughts are with his family, friends, and colleagues. DGAM, The death of Mr Hassan, the secretary of the museum, by a sniper in Bosra, available here. With the recent change in situation in Homs, the DGAM have conducted a number of assessment missions. The details below are approximate translations from the Arabic articles on their website (with thanks to Mr Abdae). The ancient market: With the return of calm to the city of Homs, the Dept of Antiquities entered the old city, and spotted a number of damages in the old market, and the outcome was as follows: several shops in the Nouri market, shoe market and jewellery market – physical damage to structure, construction and infrastructure, with collapsed portions of walls and ceilings, ruined floors, doors and windows of shops, damaged stone facades as a result of fires. It is noteworthy that the market in Homs is old: it is a complex of about 15 ancient markets, consisting of corridors and surrounding boutiques. Read the article with photos, Pictures: Extent of the damage in the old market of Homs, here. Homs Museum: Now the security situation permits accessed to the Department of Antiquities in Homs, the Dept has been able to visit the museum building and the Department to inspect the damage to them. They have stated in the report that the building of the Museum of Homs is in good condition, and the damage is limited to the glass windows, and doors, as well as office furniture and equipment, and documents. Museum collections were transferred to safe places at the beginning, and are still preserved and in good condition: the team will inventory them during the coming period. The Department inspected the damage to the museum building in August 2012 and documented it then – no changes have occurred. 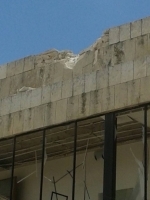 Read the article, Pictures: Damages to the Museum building in Homs and the Department of Antiquities, here. Religious buildings: A technical committee of the Department of Antiquities in Homs began an inventory and initial assessment/estimation of the damage caused to the old buildings of the old city, where the structures of many of the religious buildings were partly damaged. Most affected was the Dalati Mosque or Mosque of Sultan Abdul Hamid, also known as the Mosque of Adaakk . This Mosque is considered one of the most important Islamic monuments and archaeological sites in Alhamidiyah Street in Homs. According to the report of the Technical Committee, the bulk of the minaret of the mosque has been destroyed. Bombs tarnished its southern and south-eastern interfaces, and shattered a large section of windows and wooden doors, as well as shops belonging to the mosque. They also demolished the southern part of the mosque and a large part of the roof. The minaret of the Virtues mosque in the area of Bustan Al-Diwan, which is characterized as high and square-shaped, has been destroyed – only the bottom still exists, which constitutes one-third of the minaret. The greatest damage happened to the eastern entrance and to the courtyard of the mosque. A lot of contents of the mosque were stolen. The Nouri Mosque also has been damaged. Most the of the damage happened to the southern and western entrance which leads to the courtyard of the mosque, also destroyed the roof and walls partially, and exposed portions of the interior walls and the southern facade of the fire, and collapsed the top of the minaret, has also been monitoring a large number of holes in the contracts within the campus. It is noteworthy that Nouri Mosque is one of the largest and oldest mosques in the old city of Homs, and is similar to the model of architectural Umayyad Mosque in Damascus in the terms of its structure and its architecture. There has been limited damage to the Al-Khoder & As-Sarraj mosques, in the courtyards of the mosques and minarets. Read the article, Pictures: Damage in religious buildings in old Homs – first glimpse, here. Additional buildings: The photos shows the extent of damage caused to these buildings, as observed in Dar Abdullah Farkouh. Some parts of the entrance to the west were demolished, in addition to damage to an interior entrance, hallways of the building, and the collapse of part of the outer wall. The images show the main damage to the Arba’ien (forty) church in the Ghassaniya school. The roof the building was destroyed, the tower of the church damaged and the historical clock. The old Coffeehouse/Café (Qahwat Al-farah), which played an important role in the social life of the city of Homs, was built in the early last century: this building was subjected to a fire. There was serious damage to the roof and walls of the building. (Read the article, Pictures: damage to buildings in old Homs – a second glance, here.) 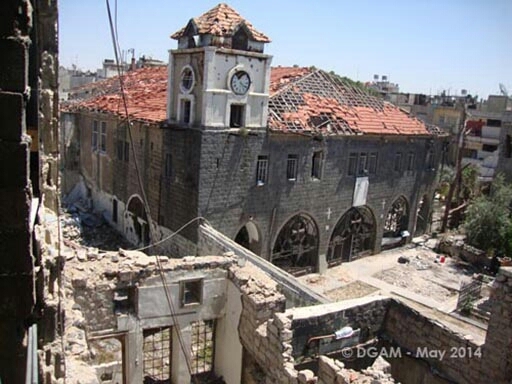 The Department of Antiquities & Museums in Homs wrote a third report about the damage in Homs, covering the Museum of Popular Traditions (Qasr Al-Zahrawi) and the Centre for Archaeological Studies and Documentation (Dar Mofied Al-Amin). There was damage to wooden doors and windows, but the building remained completely intact in terms of construction with minor damage in the northern interface of the building. The dome of the palace was destroyed, as well as the north-west part of the Ottoman wing, with the loss of the bulk of the whittled wooden doors and windows and wooden interiors, and the destruction of office in the administrative section of the palace. The National Museum of Aleppo was hit twice by mortar strikes at the beginning of June, sustaining light damage to the structure and the gardens. However, several employees were seriously injured: our thoughts are with them for their safe recovery. Modern-day Aleppo is built on some 7000 years of older Aleppo. News articles have highlighted the extensive network of tunnels being dug in the old city, such as the one used to destroy the Carlton Hotel. A comment in a recent article has highlighted how such tunnels are digging straight through older layers of the city, in that particular case, Roman pipes. Read the full article, Syrians wage ‘war of tunnels’ for Damascus, in the Daily Star, here. The Haron Dada Mosque, in the Qadi Askar district in Aleppo, has been badly damaged. Photos were published by Eyes on Heritage here. The Al Kadima Mosque in Aleppo has been damaged: photos were shared by Aleppo Archaeology here. Mosque al-Kchtli / al-Chtla (apologies for the poor spelling – Cunliffe) was destroyed. A video was shared here by the Heritage Division of the Free Council of Aleppo, and photos were shared by the Association to Protect Syrian Archaeology here. The al-Turantaiyah Madrasa Mosque and school, a Mameluk period structure, was heavily damaged. Photos were shared by Eyes on Heritage here. The Great Mosque in Maart has been badly damaged. A video is available here. 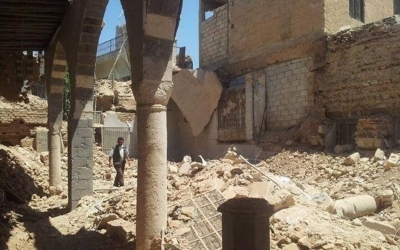 Further evidence has appeared to confirm the destruction of the synagogue, reported in our last newsletter – The Daily Beast report, Exclusive Photos: Syria’s Oldest Synagogue Destroyed, can be viewed here. Confirmation from the DGAM, with pictures – Pictures: damage to the prohet Eliyahu synagogue located in the district of Jobar in Damascus. Jobar Synagogue, in the Jeruslaem Post on 15 June 2014. Deir Aman, in al-Atareb – video of shelling and looting at the site, available here. Qa’alet al-Madiq – new photos of the damage done to the hill of the citadel , available here. The album is available here. Historic al-Mehmendar mosque, in Aleppo – report on the damage updated, available here. Shrine of Uwais al-Qarani / Uways al-Qarani, ar-Raqqah – in addition to the images we previously shared of the damage, they have added several of the remains, available here. Khirbet Rabi’a, Idlib – video about the current state of the site, available here. The Roman road at Tell al-Kerama – video about the road, available here. A recent raid on a leader of ISIS led to the seizure of meticulous accounts, detailing the looting and sale of millions of dollars of antiquities, many from Syria. Chulov, M. 2014. How an arrest in Iraq revealed Isis’s $2bn jihadist network. The Guardian, available here. The apparent conflict in ISIS, who are also responsible for the recent destruction of the statues in Raqqa, as well as shrines and other archaeological remains, is discussed in this article by Sam Hardy in his blog, Conflict Antiquities. The DGAM recently gained access to the Tentative World Heritage site of Ebla, and conducted an assessment of the damage. They reported traces of digging using heavy machinery, although this apparently stopped in May. They saw no signs of organised gangs, although some individuals were noted in old mission excavation trenches. 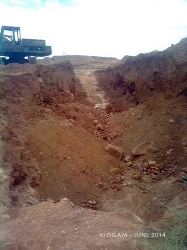 The construction work to create the training camps and warehouses had also stopped. However, a station to refine crude oil was built on the west of the hill. Read the full article in English here, or in Arabic here. Negotiations between the DGAM, civilians and the local militia have concluded with the safe return of pieces of a mosaic from Berhalia. Read the full article, Syrian Students Restore Our Global Cultural Heritage, in Counterpunch weekend edition 13-15 June 2014 here. Palmyrene antiquities continue to be seized. According to The Daily Star, 8 were seized in Lebanon, and according to Syrian Radio and TV, local authorities in Homs seized a further 8, which dated to the second century. These included two drawings depicting two Palmyrene women wearing traditional clothes and jewellery. Interesting article about the loss of cultural traditions due to the displacement of families. In particular, the article talks about traditional cooking. A Taste of Syria in Exile, in Newsweek, available here. Video report – Syrian composer wields musical ‘weapons’ in fight for peace, in Katre 11, available here, with snippets of his music. Last night saw the completion of the book tour to launch of Syria Speaks, a compilation of stories, artwork and poems from Syria. Details of the tour and the book are available here. An official Syrian delegation participated in the UNESCO experts meeting in Paris at the end of May. Details (in Arabic) here. Article about the DGAM’s work with the international community to protect their heritage. Details can be found here (in Arabic). The DGAM hosted an event relating the history and significance of Ma’aloula, a site on the World Heritage Committee Tentative List of Nominations. Details can be found here (in Arabic). We apologise to the DGAM, who have one other update on their website. It is currently being translated and we will share their information as soon as possible. After the meeting of international experts on 26-28th May, UNESCO announced plans to create an observatory to monitor the situation, share information, and coordinate and direct responses. This news article details some of the actions to be taken, A Lifeline for Threatened Heritage. 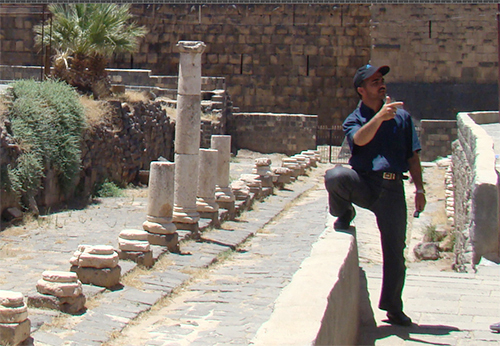 Rainer Schreg has released a new update on his blog – Archaeologik – on damage to Syria’s heritage (in German), Syria in May 2014 – two years of Syria reports on Archaeologik, available here. in addition to his other updates, he draws attention to a metal detector website called OKM, who are using adverts of the “treasure” to be gained from Syria to advertise their metal detectors, available here. He also highlights the work of Mamoun Fansa, who is working to compile evidence of the destruction of the World Heritage sites – Syria. Six World Heritage Sites in the throes of civil war, which is aimed to be completed in October. As Syria’s war rages, this cradle of civilisation is plundered, in The National, 26 May 2014. Haunting before and after pictures show how Syria’s 5,000-year heritage is being buried under the rubble of war, World Observer Online, 03 June 2014. Arabic opinion article detailing the damage done by looting and appealing for all to protect it, by M Ossman – The risks of exploration and secret theft on the future of Syrian archaeology, 07 June 2014. Al-Jazeera video report (in Arabic) about Syrians living in historic buildings, Displaced Syrians are taking up residence in historic buildings, 15 June 2014.